Indigenous Rangers are at the forefront of turning around environmental degradation across Australia. 75 Indigenous Protected Areas, covering over 67 million hectares, now make up more than 44 per cent of the National Reserve System and have created the largest contiguous area of protected arid land in the world. This is thanks to Australia’s Indigenous Protected Areas (IPAs) Programme and the Working on Country Indigenous Ranger Programme, which together enable indigenous people to protect and manage the land and resources in the IPAs. The environmental, social and economic benefits of IPAs and Indigenous Rangers are impressive. For their noteworthy achievements, these two Australian programmes were, together, recognized with the Future Policy Bronze Award 2017, awarded by the World Future Council in partnership with the UNCCD. Australia is the world’s driest continent and droughts occur that can last for many seasons. The Indigenous Protected Areas (IPAs) Programme, launched in 1997, and the Working on Country Indigenous Ranger Programme, launched in 2007, enable indigenous communities to be at the forefront of fighting land degradation and desertification in Australia. IPAs represent a contract for the management of environmental and cultural values between Traditional Owners and the federal Government and are made operational after a management plan is developed by indigenous partners. The Ranger Programme provides employment, helps revive the skills of indigenous people, and encourages the combination of indigenous ecological knowledge and Western science. As a result of these two policies, almost 70 million hectares have so far been dedicated as IPAs, creating the largest protected zone of arid land on Earth, and around 110 Indigenous Ranger teams carry out vital work, such as traditional fire management, rehabilitating and protecting enormous expanses of land and fragile ecosystems. The Indigenous Protected Areas (IPA) Programme and the Working on Country Indigenous Ranger Programme are considered flagship policies, frequently held up as rare examples of successful, popular Government indigenous policies. They have cross-party support, have survived multiple changes of government, and are genuinely led by indigenous people. Indigenous-driven campaigns calling for more funding and support for these programmes to mark their 20th and 10th anniversaries in 2017 have generated wide support and helped secure their continued expansion. The environmental, social and economic benefits of IPAs and Indigenous Ranger jobs are impressive and increasingly well-documented, with a 2016 report commissioned by the Government finding that the programmes delivered a three to one return on public investment due to a range of positive outcomes. Indigenous Rangers are at the forefront of turning around environmental degradation right across Australia; 75 IPAs now make up 44.7 per cent of the National Reserve System and have created the world’s largest contiguous area of protected arid land. They have made it possible for Australia to work towards meeting its international commitments to both the Aichi Biodiversity Targets and the Declaration on the Rights of Indigenous Peoples. Due to the exceptional support for these policies from both indigenous communities and the Government, the value and respect for indigenous culture and knowledge they demonstrate, and their success in bringing vast areas of largely arid or semi-arid remote land under protection, the two programmes received the Future Policy Bronze Award in 2017. The IPA programme governs nearly 50 per cent of Australia’s protected areas. The IPAs were recently extended to marine zones, and can include non-indigenous land by mutual agreement. Indigenous rangers carry out traditional fire management, prevention of land degradation from feral animals and invasive species, protection of vulnerable native species, remote arid area monitoring, carbon abatement through fire prevention, and water quality control. The programmes help revive indigenous knowledge and practice, and their transfer from elders to youth, building a sustainable economy around conservation. The programmes create jobs in remote, isolated areas and provide training opportunities. They are not charity-based, but provide real wages for real work. The programmes have improved education and health conditions in the local communities. They also help enable communities to generate additional income from fee-for-service work, carbon credits and tourism. 36% of the rangers are women and this percentage increases every year. There are reports of reduced crime in regions where these programmes are active, and ranger work is sometimes used as rehabilitation by law-enforcement. The ‘two toolbox approach’ of these policies combines indigenous knowledge with modern science and technology, which makes it mutually beneficial and reduces risk. The interventions regulated by the programmes are on a small scale, ongoing and monitored. The policies have led to the revival of traditional knowledge. The programmes are entirely voluntary. No IPAs can be created without the full participation and decision of indigenous landowners and communities. The land management plans are developed by indigenous people, with support from the Government and external experts where needed. There is ongoing communication with regional government representatives. Due to the long consultation process and flexibility of the programmes, very few conflicts have arisen in the regions. The programmes were previously implemented by the Environment Department, but were later moved to the Prime Minister’s Cabinet in 2013. They benefit from longstanding personal connections between government regional land managers and indigenous partners. The implementation of the programmes is largely self-governed by indigenous groups, with government support and auditing. Budgeting plans and annual audits are required. The policies are integrated with the National Reserve System and Australia’s national and international environment commitments. They are also related to the Closing the Gap Programme for ending indigenous deprivation. The policies are largely based on addressing inequality and discrimination. They help indigenous people to live healthy, valued lives on their own land. They are led and implemented by indigenous plans, priorities and knowledge. The Indigenous Protected Areas (IPAs) programme was launched in 1997, whilst the Working on Country Indigenous Ranger Programme, that supports the employment and training of indigenous Rangers to manage the land and resources in IPAs, followed in 2007. The programmes emerged due to three factors: the return of land and sea areas to traditional owners through land rights and Native Title since the mid-1990s; the need for livelihood opportunities on these largely very remote returned lands; and the realisation by the Government, land managers and other stakeholders that the threats to Australia’s biodiversity and landscapes are severe, increasing, and cannot be addressed without including Indigenous lands in the protected network, under the active management of Traditional Owners. Threats to the world’s driest continent include native species extinction, land and soil degradation, wildfires, drought, invasive species, and damage caused by non-native feral animals, all exacerbated by climate change. According to a description agreed by indigenous partners, an “Indigenous Protected Area is governed by the continuing responsibilities of Aboriginal and Torres Strait Islander peoples to care for and protect lands and waters for present and future generations. Indigenous Protected Areas may include areas of land and waters over which Aboriginal and Torres Strait Islanders are custodians, and which shall be managed for cultural biodiversity and conservation, permitting customary sustainable resource use and sharing of benefit.” IPAs are a practical, empowering way for indigenous owners to proactively assert their responsibility to protect the natural and cultural values of their country. They are recognised by the Australian Government as an important part of the National Reserve System, protecting the nation’s biodiversity for the benefit of all Australians. The Indigenous Rangers programme creates meaningful employment, training and career pathways for indigenous people in land and sea management. Its aim is to enable skilled indigenous people to combine traditional knowledge with conservation training to protect and actively manage their land, sea and culture, by being employed in real jobs with real wages. The two programmes are administered by the Environment Branch of the Indigenous Employment and Recognition Division within the Indigenous Affairs Group of the Prime Minister and Cabinet. Their implementation is organized through indigenous communities, ranger groups, Land Councils, International Union for Conservation of Nature (IUCN), NGOs and scientific institutes. Both programmes are deliberately light on provisions and regulations, to allow for each indigenous group to determine their own goals and methods, and to avoid the loss of trust that has plagued more prescriptive policies. Engagement by indigenous communities is voluntary and consensual. IPAs represent a contract for the management of environmental and cultural values between Traditional Owners and the Federal Government (according to agreed criteria that satisfy IUCN requirements). They are voluntarily entered into by Traditional Owner groups and made operational after a management plan is developed by the indigenous partners following extensive consultation processes. The Ranger Programme concept was designed to enlist and revive the skills of indigenous people and combine Western science with indigenous ecological knowledge. The success of the programme, especially compared to other indigenous employment schemes, is credited to the value assigned to indigenous knowledge and priorities, strong connection to land, flexible working arrangements that allow for family and cultural commitments, and the trust built through long-term funding arrangements. Most Rangers work on a “no work no pay” basis. IPA projects are supported through a multi-year funding agreement. IPAs also provide a framework to leverage partnerships with conservation and commercial organizations that provide employment, education and training opportunities for indigenous people. Many indigenous organizations now supplement government funding through fee-for-service or other income generating activities, as well as support from the private sector and philanthropic organizations. In 2015, 65 per cent of the total investment across IPAs and Ranger Programme came from the Government. In Australia, there are 75 dedicated IPAs, covering 67,312,453 ha, making up 44.6 per cent of the National Reserve System. Several more IPAs are currently under consultation. 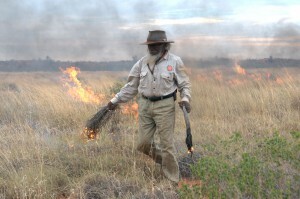 In 2014, the Pintubi Traditional Owners declared 4.2 million ha of their land an IPA, under the Kiwirrkurra IPA, providing the final link in a corridor stretching from Western Australia to the Northern Territory and into the northern corner of South Australia, and creating the largest protected zone of arid land on Earth. The Ranger Programme has grown to support 110 Ranger groups across Australia, employing over 2,600 Indigenous Rangers in full time, part time and seasonal work each year. Thirty-six per cent of Rangers are women. Support for Indigenous Ranger jobs is building a skilled workforce delivering lasting practical improvements to the environment. The social impacts of the Ranger Programme have far exceeded expectations. Communities with active Ranger groups reporting positive health and education outcomes, and reduced rates of incarceration, alcoholism and other problems. Being a Ranger or having a Ranger in the family is a source of income, stability and pride. Job retention rates are over 80 per cent, and special programmes are being developed to engage more women, youth and elders. Rangers receive training and many of them transition to other employment beyond the programme. This is considered one of the Government’s most transformative indigenous programmes; it helps strengthen and pass on indigenous stories, languages, and values while supporting families and protecting country. Traditional burning for conservation: Mosaic burning shaped Australia’s landscapes for 1000s of years. When indigenous fire management is no longer in place, frequent but small, managed fires can be replaced by far larger bushfires that devastate biodiversity and landscapes. Climate change means extremely hot, dry “fire weather” is becoming more frequent and widespread. Reviving traditional fire management could save enormous expanses of land from destruction. Around 88 per cent of Ranger teams carry out fire management, often in collaboration with scientists and modern methods and equipment (e.g. GPS, drones, and helicopters). Indigenous fire management is also reducing greenhouse gas emissions, and there are mechanisms in place to allow indigenous communities to claim and sell carbon credits. Controlling invasive species and feral animals: Tens of millions of non-native feral pigs, cats and goats, hundreds of thousands of feral camels and buffalo, and invasive weeds capable of occupying entire climatic zones, threaten Australia’s unique natural heritage and create huge costs for agriculture and infrastructure. Australia’s Threatened Species Strategy names IPAs and Rangers as a “critical” element of tackling species decline. Practical solutions being applied include: wide-spread feral animal control, threatened species protection, invasive weed eradication, prescribed burning, assisting with monitoring, and revegetating/seeding land with native species. Rangers are also employed by private landowners (e.g. mining companies) to provide these services on non-indigenous-owned land. Managing freshwater: Ranger teams contribute to waterhole management, test and report on water status throughout IPAs, protect water sources from invasive species, remove dead livestock and feral animals, protect wetlands with fencing, etc. The Indigenous Protected Areas (IPA) Programme and the Working on Country Indigenous Ranger Programme are highly transferable to other countries with land under indigenous stewardship. To date, the best case of transference is through exchanges with First Nations communities in Canada. Australian Rangers first visited Canada in 2012 to share their experiences with several indigenous groups. This helped inspire a movement to establish Indigenous “Guardians” in Canada, citing IPAs and Rangers as a model, and leading to the Assembly of First Nations passing a resolution in 2015 calling for a national Guardians programme. In March 2017, the Canadian Government announced the award of funding and support to set up the Guardian network. The Ranger Programme concept was designed to enlist and revive the skills of indigenous people and combine Western science with indigenous ecological knowledge. The success of the programme, especially compared to other indigenous employment schemes, is credited to the value assigned to indigenous knowledge and priorities.